Write mailbox folder access is not supported in OWA. Instead, full mailbox access must be given to a user to access and manage content in other user’s mailboxes. For more information refer to http://support.microsoft.com/kb/811646/en-us. How can I restrict users to viewing the address list of their own organization, not the entire Global Address List (GAL)? b) A custom Exchange Address List. How can OWA be set up to use UPN logon names instead of domain\username? To set up OWA to accept UPN login names, the Exchange, Exchweb/bin and Public virtual directories must be configured to use Basic Authentication and the default domain must be configured to be “\”, no quotes. To step through the configuration, refer to http://support.microsoft.com/?kbid=267906. How can I disable multimedia file access for my OWA users? In OWA 2000, users can download a Multimedia Control from the OWA Options page allowing them to insert audio and video content into messages. Some administrators may decide to disable access to multimedia files to prevent high use of server resources. To disable the multimedia button in the OWA Options page, open the registry editor (regedit) and navigate to HKEY_LOCAL_MACHINE\SYSTEM\CurrentControlSet\Services\MSExchangeWEB. Create a key named DisableMultimedia and set the value to 1. Care should always be taken when making edits in the system registry. For more information on this and other OWA registry keys, refer to http://support.microsoft.com/?kbid=311342. How can I change the reminder polling interval for OWA 2000 users? The reminder polling occurs every 9 minutes by default. To change this value, open the registry editor (regedit) and navigate to HKEY_LOCAL_MACHINE\SYSTEM\CurrentControlSet\Services\MSExchangeWEB\OWA. The key name is ReminderPollingInterval. Care should always be taken when making edits in the system registry. How can I change the new mail notification interval for OWA 2000 users? The new mail notification polling occurs every 2 minutes by default. To change this value, open the registry editor (regedit) and navigate to HKEY_LOCAL_MACHINE\SYSTEM\CurrentControlSet\Services\MSExchangeWEB\OWA. The key name is NewMailNotificationInterval. Care should always be taken when making edits in the system registry. Why are some users not logged of OWA after clicking the Log Off button? On a front-end server running Exchange Server 2003 or 2000 users are not logged of correctly due to a permission issue on the Logoff.asp page or the /exchweb/bin is configured for Integrated Windows Authentication instead of Basic. For more details and for the instructions on how to correct these configuration issues, refer to http://support.microsoft.com/?kbid=927907. How is the Change Password feature implemented in OWA? The change password feature is not enabled by default in OWA 2000 because it is a feature of IIS, not Exchange 2000 Server. The IISADMPWD virtual directory must be created in IIS under the OWA website and the Change Password button must then be enabled from within the registry. For more information refer to http://support.microsoft.com/?kbid=297121. 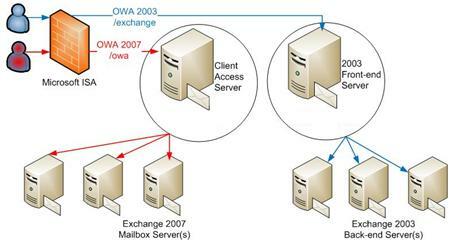 This article walks step by step through the process of securing OWA 2000 using SSL. Includes helpful screenshots and links to more articles on OWA 2000.